The author, Madame Guyon, was born in south-central France in the mid-1600's. Her writings and her ministry knew a brief period of popularity, making her a friend even of the wife of Louis XIV. She greatly influenced the life of Fenelon, one of the two most famous clergymen in France's history and earned the wrath of the other, Boussuet. The conflict between these two giants over her teachings led to her disgrace in the king's court and then to her imprisonment. The clash between Boussuet and Fenelon enthralled and scandalized the whole of France. The continuing feud had to be settled by the Pope himself. The influence of Madame Guyon has never wavered with the passing of centuries. Her writings have influenced movements such as the Moravins, the Quakers, the Methodists and the Little Flock. Leaders such as Wesley, Penn-Lewis, Zinzendorf, Judson and Nee have lauded some of her writings as among the best ever penned by a Christian, and have testified to her influence in their lives. Three hundred years later she is still one of the most influential people in the lives of those who seek a deeper relationship to Jesus Christ. 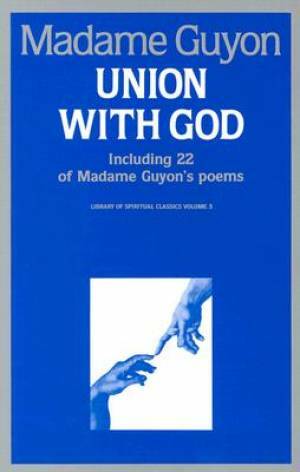 Union With God by Jeanne Guyon was published by SeedSowers Publishing House in October 1999 and is our 45913th best seller. The ISBN for Union With God is 9780940232051. Be the first to review Union With God! Got a question? No problem! Just click here to ask us about Union With God.